The Darcys….. We know they are real! Instead I shall head another direction and talk about Mr. Darcy and Pemberley, arguably a favorite subject loved by all! With 8 full-length novels and one novella written in The Darcy Saga thus far — and more on the way — I suppose it is obvious that my brand of plotting and telling a story is unique. There are several reasons for choosing this style, but one of the main delights in writing a saga versus a single novel is the opportunity to dwell with characters I adore for a long period of time. Another benefit is the opportunity to create deeper backstories. While yet writing what became my first novel — Mr. and Mrs. Fitzwilliam Darcy — I was inspired to introduce friends from Mr. Darcy’s youth and university days, these characters expanded upon and given pivotal roles throughout the saga. Eventually my yearning induced me to elaborate upon his immediate family (those mentioned or hinted at by Jane Austen), and then I took the next step of fabricating relatives for the Darcy family. George Darcy, Darcy’s uncle and the star of The Passions of Dr. Darcy, was one result of this creative desire. The eccentric Marchioness of Warrow and Mr. Sebastian Butler, hero of Miss Darcy Falls in Love, are also byproducts of my need to enlarge the family. Then I asked myself, why stop with living relatives? Going back in time, as it were, meant breathing life into deceased characters such as James and Anne Darcy, Fitzwilliam’s parents, and many others. It has been tremendous fun! With each step further into the past, my curiosity grew. Who were the Darcys? Where did they come from? Could Austen’s fictional hero be tied to established history? I had to find out! All that said, there are other possible origins to the surname, none that can be certain as the correct or only origin. For instance, the English surname Dorsey is clearly linked to Darcy, but precisely where it began and deviated is unknown. Nevertheless, while the exact etymology of the surname is questionable, tracking D’Arcys is relatively easy. The first documented D’Arcy was a man named David who descended from Charlemagne (Charles the Great, 742-814), King of France and Emperor of Rome. Fascinating, isn’t it? David’s direct descendent, Sir Richard D’Arcy, accompanied William the Conqueror from Normandy into England in 1066, the first D’Arcy to touch English soil as far as can be known. More than likely there were numerous migrations of D’Arcys not important enough to be recorded. However, the strongest ties are to Sir Richard, who became Baron D’Arcy in short order for his valorous service at the Battle of Hastings. Some genealogies connect this Sir Richard to Richard, the 4th Duke of Normandy, and while that is super cool, the facts are tenuous. In the immediate decades to follow, D’Arcys became governors, constables, sheriffs, served in Parliament, and were ambassadors to foreign courts. By 1300 the family had branched and settled in various places throughout England – York, Lincolnshire, and Derby among them. 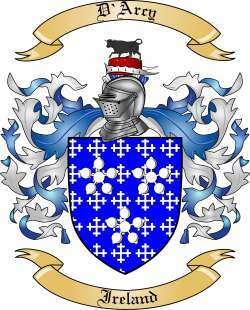 In 1320 Sir John D’Arcy was appointed Lord Justice and General Governor of Ireland. From then on the D’Arcy family figures prominently in Ireland’s history. One extensive genealogy of the D’Arcys of Kiltulla in Galway, Ireland, and how they trace from Norman D’Arcy, is detailed in four pages of A Genealogical History of the Commoners, which can be read on Google Books HERE. In England the name appears to have morphed into “Darcy” somewhere in the 1600s, long after the lines of nobility — six different baronies and the Earldom of Holderness — had fallen into abeyance. Did Jane Austen know the grand history of the Darcy surname when she named her best-loved hero? I suppose it is possible, considering how well educated she was. Or perhaps it was simply luck that the name she pulled out of thin air belonged to a noble family with a fascinating history! Whatever the case, incorporating true Darcy ancestry into my Darcy Saga series didn’t occur to me initially. My delving into the far past was limited to a couple of vague references to an ancestor, and the extensive family tree tapestries hanging in the foyer of Pemberley. Then I began writing an as-yet unfinished novella, and thought it would be fun to meld historical fact with fiction to explain the origins of the Derbyshire branch, using that “second son” idea. All for the love of Darcy, you see! Thus, for your enjoyment today, here is my vision of Mr. Darcy’s ancestry, with an added clue as to the character traits my version of the Darcy characters ofttimes display. Enjoy! In 1423, so the annals securely housed in the Pemberley library record, second son Frederick D’Arcy left his comfortable home in Ireland with his modest inheritance safely stowed inside his baggage. Alone he boarded a ship at Cork, but smiled as he waved farewell to his tearful family lining the wooden dock. Ever the adventurous boy and youth, no one was surprised at his decision to explore foreign lands seeking fortune and new experiences. Nor did they anticipate more than rare, abridged correspondence as the years passed. For a person imbued with a spirit of wanderlust and mischief since birth, Frederick being the first D’Arcy to depart Ireland for over one hundred years was naturally predetermined. When Frederick suddenly reappeared on the doorstep of his family’s residence outside Bandon in Cork after nearly thirty years away, happiness was the prevailing emotion. He was greeted with open arms, tears of joy, and a spontaneous feast that lasted a week. Equally welcomed was his blonde, blue-eyed wife and infant son. Undoubtedly of Germanic or Scandinavian birth, the story of Frederick meeting and wooing his bride was merely one chapter in the grand tale recounted to awestruck family and friends. They were dazzled by revelations of the vast wealth he had acquired, the breadth of lands he had traveled to, the daring adventures encountered, and the famous people he had befriended along the way. Repeated until memorized, many were destined to become family legends wildly embellished by succeeding generations. Yet what was most staggering was his announcement that the famed adventurer, the brave D’Arcy whose name was whispered with reverence and pride, had changed his surname to the neutral “Darcy” and planned to settle in England to become a gentleman landowner! Frederick Darcy considered life as a proper husband and father a serious undertaking and formidable challenge. As with his excursions abroad, he doggedly set his mind to the task and feet onto the path, determined to create a legacy greater than any tale of adventure. First he purchased a sizable portion of land in Derbyshire located on the southerly edge of the Peak with the River Derwent running through. A sturdy house was built for his expanding family, several dozen sheep were purchased, and local citizens of the shire were hired to assist in his farming and livestock endeavors. The humble estate was named Pemberley—for reasons never recorded—and by the time of Frederick Darcy’s death at the ripe age of ninety-three, Pemberley had more than doubled in acreage and worth. As the decades rolled into centuries, the Darcy family multiplied in numbers, influence, and wealth. A new Pemberley manor was built in the late 1500s, with renovations and expansions over time increasing the mansion’s square footage and grandeur. The estate’s acreage multiplied exponentially, as did its importance with more and more families in the area coming to rely upon the wisdom and protection bestowed by the Master of Pemberley and his kin. Every Darcy born, male and female, learned of their ancestry with pride. Forever at the pinnacle was the legend of hearty Irishman Frederick Darcy. Intrepid adventurer, fearless trailblazer, solid citizen, cunning leader, and devoted family man, Frederick was the example of all that a Darcy should be. After three-hundred-years, his core traits held true amongst his progeny. Of course, not always did the traits evident in the older, steadfast Frederick Darcy outweigh the characteristics prominent in the young, audacious Frederick D’Arcy! Wanderlust frequently attacked a Darcy youth, some never heard from again, and rare was the child of Pemberley who did not enjoy causing trouble…. From time to time. I hope you enjoyed that snippet of Darcys past. Naturally this is my imagination giving life to Austen’s characters, and in no way the definitive answer. Diverse imagination is why there are SO many authors like me who expand upon the novels of Jane Austen in myriad ways. Hence our purpose on this blog……. 57 Responses to The Darcys….. We know they are real! Who knew that proud, aloof aristocrats exist in the real world? That is a fascinating family history! Yay for the Darcys! So exciting to know that they are real. Now we just have to find which real Darcy was portrayed in Austen’s P&P! Thank you so much for this post, Sharon. It is rich in history and I crave that. Your introduction of new family members and characters into the Darcy family has broadened my circle of “friends”, for that is what they feel like. It’s like a family reunion when I read your stories. Well done, Sharon. Great post! A wonderful way to get things started. Enjoyed your post, Sharon. It is always interesting to read about the history of a name and especially this one. I’m so late to this, Sharon, but I loved reading about your research on the real Darcys and your version of the fictional heritage! I once tried to figure out if Fitzwilliam Darcy could have been a real inspiration. Perhaps the son of a daughter of one of the barons and she was therefore no longer a Darcy and couldn’t claim the title, but really nearly all of them ended up with girls by Darcy’s time! It was all part of a fight Darcy and Elizabeth had over naming their sons (if you look at those lines there is a legacy of naming the eldest son Conyers) for an epilogue in one of my stories but it all got cut. The world will never know that Darcy didn’t want to pass on his name of Fitzwilliam, although it was Elizabeth’s wish, and they compromised in calling the boy by his middle name, Conyers, just for him to go to school and come home insisting on being called Connor instead. Anyway, I love your research and writing! After reading your post, it does seem fitting that you kick off the blog in this way. Goes right along with your saga. Love it! Thank you for sharing. And congratulations. This was great, Sharon! A kickoff filled with pageantry. Makes me want to write about knights and their damsels. I have a family history of my own for the Darcys in The Madness of Mr. Darcy. I enjoy genealogy, and I liked your very different vision of the family’s history. Love seeing the family crests. Well done!